Large corporations, government institutions, and service providers require highly scalable storage that spans large areas and are highly available. Fibre Channel offers solutions for high-end SANs that meet regulatory requirements for off-site storage and disaster recovery. Typical applications of advanced SANs include banking, insurance, online transaction processing (OLTP), and service providers. Financial institutions have special legal requirements related to data integrity and disaster recovery. Government agencies audit these institutions to guarantee that data is secure and of the highest integrity. Every stock transaction, money transfer or credit card purchase follows regulations that have direct impacts on the design of SANs. This case study of a financial institution involves Centennial Savings. Centennial is a metropolitan bank with a headquarters and 20 branch offices in a single metropolitan area. Data is centrally stored at the downtown headquarters as shown in the network of Figure11. Centennial has been growing steadily and will open its first out-of-area branch office in a city 150 miles away. Centennial’s MAN connections to a remote web host and each branch office have been overloaded a number of times. Centennial plans a number of upgrades to its existing network. 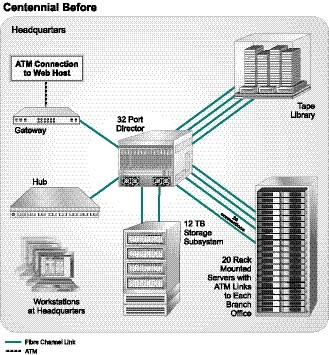 Figure 11: The original Centennial SAN is nearing capacity on their 32-port director, and the bank is paying high fees for ATM links and offsite tape vaulting. Dark (unused) fiber has been deployed in their area and Centennial is ready to utilize this new resource. 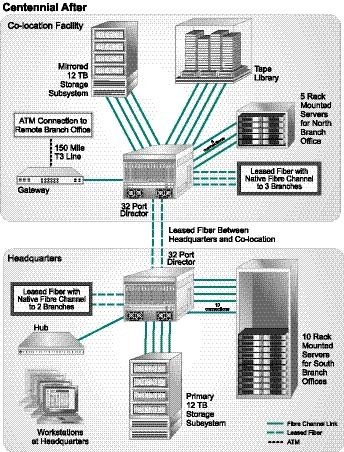 Figure 12: The new Centennial network utilizes leased fiber to connect six branch offices and the co-location facility at gigabit speeds. Centennial is considering deploying WDM equipment at each end of the leased fiber so that other data and telecom traffic can be sent across the same leased fiber. Centennial utilizes remote mirroring to have two simultaneous copies of their crucial data permanently available 24/7. Centennial’s IT department has been exploring a number of upgrade options. The IT department has discovered dark fiber exists between their facility and a co-location facility at a Network Access Point (NAP) to the Internet. With the co-location facility, the bank has shifted their off-site tape service to the co-location facility and mirrored the storage subsystem at the NAP. The mirrored storage will increase their Internet response time as well as their access to the Internet. The co-location facility and services were a win-win situation that Centennial couldn’t pass up. Centennial’s new network is shown in Figure12. Centennial found that they can now lease dark fiber and have gigabit connectivity for less money than their previous T1 (1.54Mbps) and T3 (45 Mbps) connections. Centennial leased dark fiber to five branch offices to reduce monthly expenditures significantly while increasing connectivity. After buying twelve long distance ( > 50 km) Fibre Channel transceivers, they have gigabit connectivity to each branch office. Centennial is also considering purchasing WDM equipment that would allow them to carry Gigabit Ethernet and telephony over the same leased fiber. Many financial institutions have taken advantage of the benefits of SANs. Fibre Channel has become a core technology that enables the expansion and management of complex data environments. Fibre Channel enables high levels of security and integrity that make it the right choice for highly available data networks. xSP stands for a service provider that can deliver Applications (ASP), Internet (ISP), Storage (SSP), Business (BSP), and other services. Most service providers can no longer supply only one service, because customers want solutions that span multiple services. Many xSPs have seen tremendous growth, and mediocre network solutions become big problems when their networks scale to hundreds or thousands of systems. This case study for xSPs is based on Triak Services. Triak Services began as an ISP, evolved into a web host, and is currently integrating On-Line Transaction Processing (OLTP) and web services for hundreds of clients. 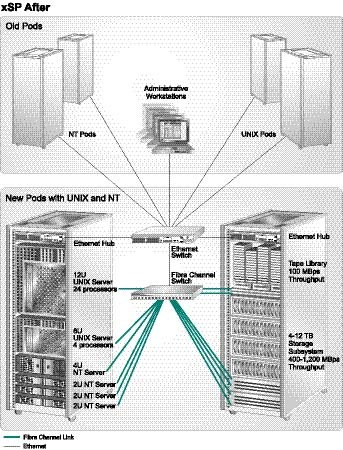 Triak’s standard procedure for new customers was to assemble a pod, which is a rack with one or two servers, directly attached SCSI storage, and an Internet connection, as shown in Figure13. This model grew successfully until a customer asked, “What is your backup plan?” This question had serious implications for which Triak did not have an answer. Table 2: Triak Services out-sources storage and applications for small and medium-sized corporations. Triak is expecting its storage requirements to grow to over 100TB of storage over the next three years for current customers. If Triak meets its business plan, three times as many customers in three years will bring the storage total to about 500TB. 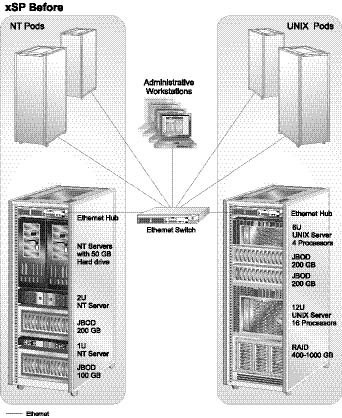 Figure 13: Triak originally deployed individual servers and storage for each new customer. As Triak grew, they had difficulty finding staff to support their JBOP (Just a Bunch of Pods). They also did not have a backup strategy for their customers’ data. Figure 14: The new pods based on Fibre Channel SANs utilize the latest storage technologies that offer increased manageability. The data in the new pods are regularly backed up with automated software, and the total cost per gigabyte was below the cost of the directly attached SCSI architecture. Triak contacted a storage consultant to develop a scalable infrastructure that could be backed up and restored effectively. The first flaw the consultant found was that Triak did not have a storage network to back up the data. The only way the pods were connected was by an administrative Fast Ethernet connection that could support about 5 MBps of data throughput. At this rate, backup of the current 43 TB of customer data with a dedicated Fast Ethernet network would take about 100 days. Luckily for Triak, the consultant also found that only 60% of the storage capacity was utilized. This pointed to another problem: Triak was wasting customer’s money because 17 TB of storage was unused. The savvy consultant proposed a new pod architecture, shown in Figure14. The new pods utilize multiple servers, a single storage subsystem, a Fibre Channel switch, and a tape library. These pods could support up to 12 TB of electronic storage and utilize virtual tape servers that can back up and restore data at 100 MBps. Now a 12 TB pod could be backed up in a little over 3 hours. Each pod could support between 20 and 80 servers, depending on the data requirements of each customer. The beauty of this new pod design is that the storage is virtualized and manageable. With a single storage subsystem and simple management software, storage utilization has reached 85-90%. The new pod architecture has led to a 20% increase in Triak’s bottom line. After Triak deployed the new pod architecture, they offered their customers new services that included tape backup and disaster recovery services. Triak never did inform their previous customers that their data wasn’t being backed up because it wasn’t cost effective. Lots of data is still on the verge of being lost. Advanced SANs offer scalability and performance benefits to customers with colossal data needs. The first case study showed how a metropolitan bank utilized leased fiber to expand their network. A co-location facility offered improved connectivity to other networks and was a good location to meet off-site vaulting requirements. The second case study showed how an xSP grew to such proportions that its pod model became unmanageable and risky. A new pod architecture improved manageability and stability at lower cost. The firm could also back up the new pod to make sure that valuable customer data was not lost. The variety of applications is endless, but the basic needs of storage networking remain the same. IT staff need manageable infrastructure that scales. Fibre Channel offers the core networking technology that increases performance and scales easily. The hardware is designed to be managed by easy-to-use software that interoperates with multiple vendors. Fibre Channel SANs are solutions for today’s and tomorrow’s storage networks. Financial Institutions: — Financial institutions must follow government mandates for data integrity. Requirements for off-site storage and transaction security across metropolitan areas are met with Fibre ChannelSANs. xSPs — Service Providers are seeing exponential growth in storage requirements as they consolidate other companies’ storage in their facilities. SANs are easily scalable to support the hundreds of terabytes of storage that corporations demand today.